My Dad loved to make challah French toast for us on Sunday mornings. He would make a big production of it, even wearing a chef’s hat for this important event. He mixed his secret formula…it wasn’t just a dozen eggs in his batter; heated his cast iron skillets…the best to make French toast; prepared the bread…cutting it into thick slices; and getting the bowl ready to receive the finished toast…it had a lid so that the toast was warm so we could all eat at once. Making French toast made him happy! It took him to a joyful place! 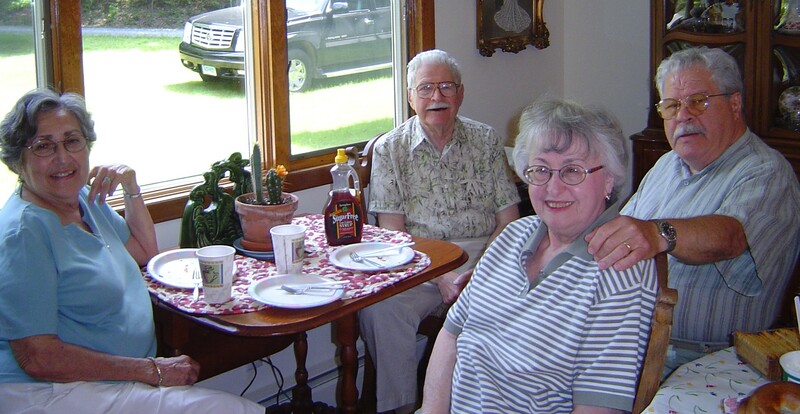 My parents and Aunt and Uncle after a healthy French toast breakfast. We would set the table. Putting out all the needed accessories. In our home we put sugar on our French toast, but when others came to visit there was also syrup as well. And there had to be cut up fruit: cantaloupe, berries, watermelon, honey dew. These were important side dishes to have along with the toast. Once it was ready, we would all sit down to eat together. It still is my most favorite meal. I could eat French toast all day every day. When we were done, it was time to clean up. Of course my Dad never cleaned up the mess he made. And it was a mess! That was the job of my Mom, my sister and me. But I did not care, I loved this meal so much!! In the Catskills my father held a Challah French Toast Feast Sunday once every summer. He planned it to be on a weekend when I brought my children to New Jersey and New York for our annual vacation. My cousins, who had summer homes in Kauneonga Lake, were all invited. Sometimes other relatives and friends came up for the weekend. It was my Dad’s French Toast Feast and all were invited. For weeks he would tell my cousins the exact day and time they were expected to arrive. It was always in the mornings so it did not interfere with time on the lake, because we would all be going to the lake later in the day. In fact part of the breakfast conversation was to plan events for the rest of the day. 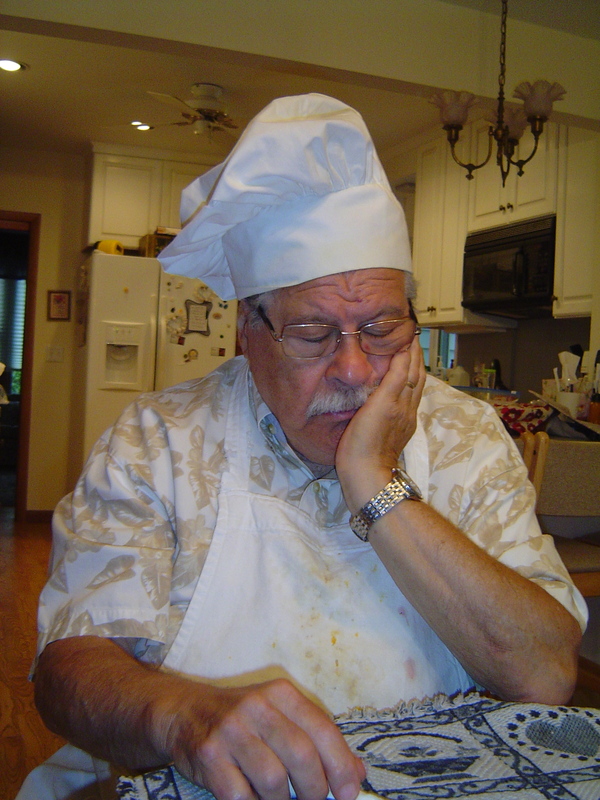 My Dad after an exhausting morning of cooking French toast. My Dad was in his element. He lorded over the stove top. He would buy extra challah each week and put it into the freezer to be ready for this big event. He spent hours slicing bread and preparing his batter, calling my cousins to remind them…over and over. He loved the chaos of all the people talking and sharing and eating. We had orange juice, milk and coffee. Sometimes my Dad would call one of my cousins, because he forgot something. They would have to make a grocery run for him. And because he was worried there would not be enough to eat, there was always bagels, lox and cream cheese as a side dish. It was always a special and crazy breakfast. I loved our Sunday morning French toast breakfasts. 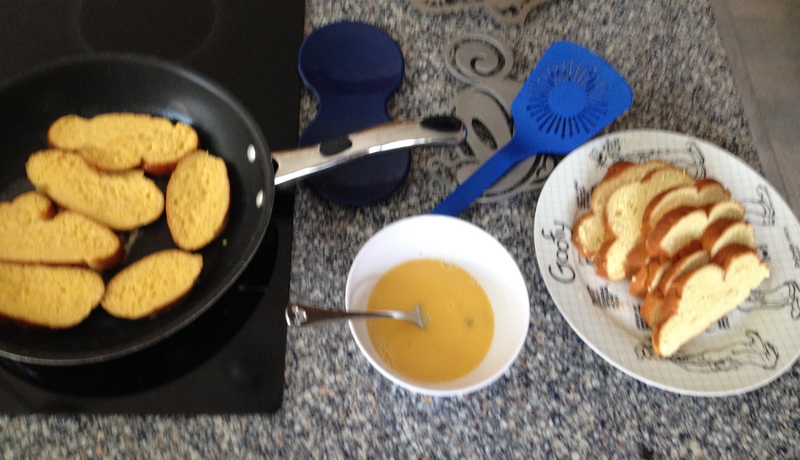 When I became a Mom, I would make challah French toast on Sundays for my children. And when my husband was out of town, I sometimes made it for us as a special treat for dinner. YUM. French toast at my home. I still make French toast on many Sunday mornings, even though my children no longer live with us. However, my son still lives close by. I often text him a few days in advance to say: Making French Toast on Sunday? You coming? The response is almost always ”What time?” He always is on time for French toast. I am happy to say that I have passed the love of challah French Toast onto the next generation.